Toners and drum units not included. Connect the HL-3150CDW locally via USB or connect it via LAN or WLAN in your network. 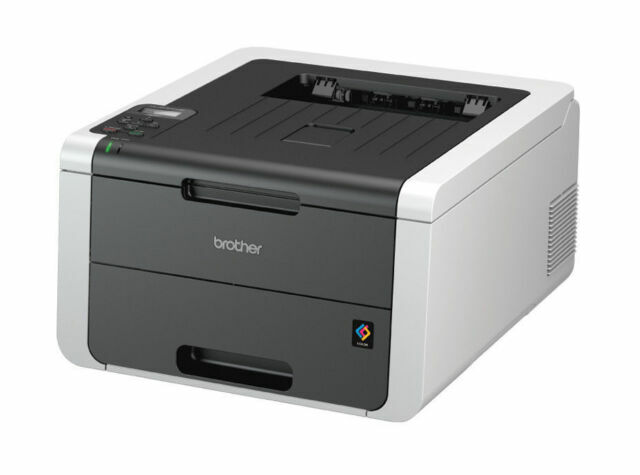 Take advantage of the many opportunities the HL-3150CDW to connect to your mobile devices, such as the Brother iPrint & Scan app, Air Print, Google Cloud Print or Wi-Fi direct. Easily create double-sided business documents with the built-in duplex unit. Save time with a high printing speed of 18 pages a minute in both black and white and in color. The HL-3150CDW is characterized by its compact dimensions the ideal color printer for your workstation. Through the bypass tray different formats, such as envelopes, letterhead, labels, glossy paper and thick paper can be printed easily. I bought my brother colour laser printer because I was so pleased with the quality of my earlier black and white printer of the same brand. I was not disappointed it is a very well made sturdy piece of kit the print quality is also excellent! My only slight gripe is the fact that it was for me a little challenging to get up and running and although I have it working perfectly in wired mode I am still struggling to crack the wireless function. The Machine I am sure will be easy to set up using the supplied installation disks unfortunately I have no CD Rom drive on my laptop which complicates things slightly. This is a really good printer. Over many years, I have gone through a lot of printers and prefer the Brothers. The word "compact" is relative to some of the monsters out there, so read the dimensions section of the specification. It is larger than most monochrome printers, although common sense tells you that the print cartridges need space. Setup is easy but made a lot easier if you have a handy USB printer cable for the purpose. The setup instructions are easier to understand when using USB cable for the purpose.That makes it a LOT easier and the cable is simply 'pulled' and put to the side after setup. It is surprisingly quiet when 'waking up' and printing, making it ideal for a small home office arrangement. The easy set up guide was not quite as easy as told. after 4 attempts i was able to get my laptop to sync. I was hoping it would plug and play with windows no such luck. After setting up i had to go through the same performance with my wifes laptop. long winded. I was hoping they would realize unless you are a computer geek some of the instructions and language they use are a bit misleading. the double sided print is a great feature though easy to set up. Haven't tried increasing resolution for pictures so they are a bit naff. Otherwise so far, for the few items i print a; ll is well. Dell have a smaller laser printer but it's not actually smaller as the paper trays stick out. I've had 2 of the dells so decided to try this. So far so good, I like that the paper is enclosed inside because my workshop is dusty and the dell sucked in the dust. I think the dells printed better pictures on cheap paper but for normal documents I see no difference. Hope this helps. Garden Leisure NI Ltd. It plugged and played in a moment - Using a Mac though. The supplier service was excellent and I'm happy. I bought a full set of toners at the same time. The quality and speed is excellent. I've yet to explore its full capability.